NEW YORK (March 2, 2012) – Today, the House of Cartier showcased its standout creativity and innovation with the international online release of “L’Odyssée de Cartier” – a three-and-one-half minute film that chronicles Cartier’s 165 years of rich history,, offering viewers a tour of the one-of-a-kind jeweler’s cultural influences that include France, Russia, China and India. Making its U.S. television debut on Sunday, March 4, “L’Odyssée de Cartier” – directed by one of the world’s leading advertising directors, Bruno Aveillan – will air in its entirety during prime time on national TV networks. The film tells the story of the jeweler’s unique history, from its beginnings as a jeweler to European royalty to its modern-day worldwide luxury status. It reveals a glimpse into an imaginary world inhabited by Cartier’s designs, under the watchful gaze of its familiar muse, “La Panthére” (The Panther). The film features many of Cartier’s most enduring and iconic designs, including the “Tutti Frutti” style, jewelry of the Maharajas and a reference to the Santos watch, which was the first modern watch designed to be worn on the wrist. The original score for “L’Odyssée de Cartier,” which was composed and arranged by renowned orchestrator Pierre Adenot, was recorded at London's legendary Abbey Road studios. Supermodel Shalom Harlow portrays the “Lady in the Mansion” and modern-day muse, embodying the spirit of the Cartier woman – elegant, passionate and independent. The filming took place over the three months with a crew of 60 people on location. Since its inception in 1847, the House of Cartier established its name around the world. The Cartier brothers were among the first to create a global business with Louis Cartier remaining in Paris to oversee the boutique at 13 Rue de la Paix (1899), Jacques opening a boutique at 175 New Bond Street in London (1909) and Pierre establishing the U.S. business with a boutique on Fifth Avenue in New York (1909). Discovering the world was a passion shared by the three brothers, who forged friendships with legendary figures whom they met throughout their travels. The film retraces the cultural influences and exceptional encounters that played a special part in inspiring the House of Cartier’s vision. For the first time with this film, Cartier displays the worlds it has imagined through its creations. The longevity of the brand is found in the legacy of its jeweled keepsakes. “L’Odyssée de Cartier” was screened for the very first time at a special premiere hosted by Cartier at The Metropolitan Museum of Art in New York on February 29. The film was also presented in 15 of the greatest cities in the world, including Paris, Milan, Munich, Beijing, Seoul, Moscow, Dubai and Rio de Janeiro. It will be broadcast to the public in many countries on TV and in cinemas. 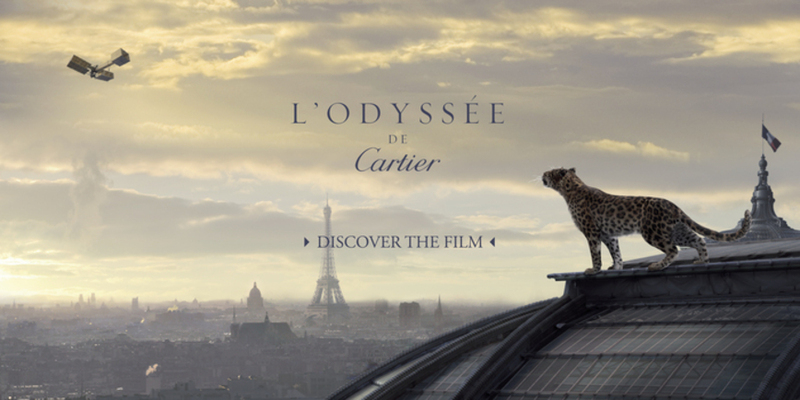 To view the film online, visit facebook.com/cartier or odyssee.cartier.com. Founded in 1847, Cartier is one of the world's most esteemed luxury houses, designing and manufacturing exclusive collections of fine jewelry, wristwatches and prestige accessories, distributed through close to 300 Cartier boutiques worldwide. Cartier has 36 boutiques in the United States and 2 boutiques in Canada. Founded in 1847, the House of Cartier has long been identified with quality, craftsmanship and creativity, and has served as crown jeweler to 19 royal houses.